So I was playing around with still more avocados and thought I'd try making a soup. Rather than using typical South-of-the-border type flavorings, I veered into a completely new direction and went to Thailand. The rich buttery flavor of the adaptable avocado should make an interesting substitute for a creamy rich ingredient like coconut milk, don't you think? 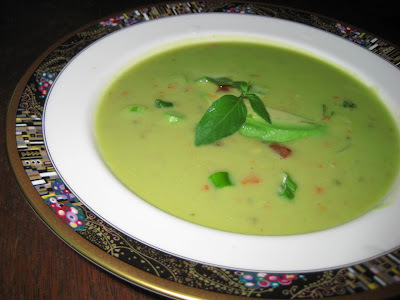 Rather than taking the easy way out and adding avocado to a Tom Kha in place of coconut milk, I decided to make a soup redolent of my favorite Thai condiment, chili basil paste. The unctuousness of the avocado cut some of the heat of the chile, but allowed the basil to shine through. The lemongrass and lime juice added a bit of citrus to cut the richness, and the chunky bits of cold vegetable garnish added some nice textural variation. I was quite pleased with the result, and think it would also work as a cold soup, perhaps with more sour cream and a bit more seasoning. In a large saucepan, sauté onion in a bit of oil with a pinch of salt until onion starts to soften and brown slightly. Stir in chili basil paste, lemon grass, and garlic and cook until the mixture smells aromatic. Pour in the chicken stock and bring to a simmer. Reduce heat to low. Halve avocados and remove pits. Scoop the flesh of 2 1/2 avocados into a blender. Add the lime juice, sour cream, and a ladle-full of the chicken stock mixture. Blend until smooth. Stir the avocado mixture into the remaining chicken stock and add fish sauce and agave nectar. Taste for seasoning and add more fish sauce or salt, as needed. Turn the heat up to medium high and allow the soup to come to a simmer but not boil. Remove from heat. Ladle into shallow bowls and garnish with the remaining 1/2 avocado, sliced or chopped, some scallions, a bit of tomato, and fresh basil. Serves 4. That soup is gorgeous and souns delectable. You should send that one to the Volt brothers.